Abstract: Negotiation between a supplier and a buyer is complicated when they face uncertainty. In addition, the timing problem for them to reach agreement becomes more difficult when the buyer faces elastic demand. This paper proposes a negotiation model representing a supplier and a buyer under uncertainty about the supplier's cost and the buyer's revenue when the buyer faces fixed and elastic demand. The agreement thresholds (the critical point for them to reach an agreement) and trade zones (the possible contract price scope between them) are determined using real options approach. 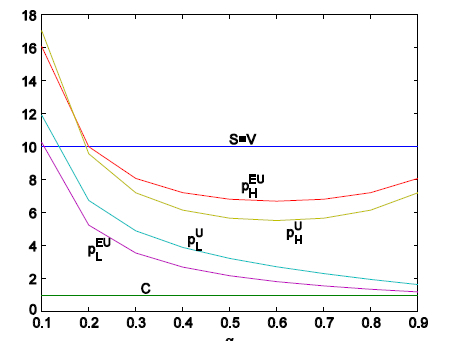 Comparisons of agreement thresholds and trade zones under uncertainty with fixed demand and elastic demand are made when the reliability of the supplier and the market risk are varied. The results indicate that the agreement threshold is lower and the trade zone is wider when the buyer faces elastic demand. The results also indicate that the agreement threshold becomes lower and the trade zone becomes wider when the reliability of the supplier is improved, independent of the buyer facing fixed or elastic demand. Moreover, with the market risk increasing, the agreement threshold becomes lower and the trade zone becomes wider when the buyer faces elastic demand, while the agreement threshold becomes higher and the trade zone becomes narrower when the buyer faces fixed demand. The results of this paper could help a supplier and a buyer to make better negotiation decisions when facing uncertainty under different demand conditions. Reference: S. Zheng, R.R. Negenborn. Price negotiation between supplier and buyer under uncertainty with fixed demand and elastic demand. International Journal of Production Economics, vol. 167, pp. 35-44, 2015. Request: A copy of this publication.